I get excited when I see Black Bear Casino. It means I’m close. I skipped breakfast to start my drive north on Interstate 35 through the early fog. I passed the usual landmarks along the way: the Forest Lake interstate merge and the North Branch Outlet Mall, which signals I’m an hour outside of the Metro. A few miles later, I passed up a cinnamon roll at Tobie’s in Hinckley—the once-legendary swirls of puffy heaven have declined over the years into crusty mediocrity. The coffee I made before leaving the Cities is now bitter and cold. Half-way there. It starts to feel like I’m farther north. Pine and birch begin leaning into the highway. The billboards stop advertising electronics and media, and start in on golf and fishing and Jesus. I drive around a bend and the Black Bear marquee suddenly rises from the forest. It’s advertising a buffet and a comedy show, and the hunger sets in immediately. Not for the buffet, however. Passing the casino means I’m only 10 minutes from Gordy’s Hi-Hat. Minnesota Highway 33 cleaves due north just as I-35 veers northeast toward Lake Superior. It leads into the Iron Range, with Cloquet serving as the gateway city. Stoplights increasingly sprout up as the highway bisects the town. The only service station ever designed by Frank Lloyd Wright is at the southeast corner of Highway 33 and Cloquet Avenue. Growing up, my uncle Bill would always point it out like a giddy tour guide. Then the highway crosses the St. Louis River. On one side of the bridge, a United States Gyspum manufacturing plant looms over a lonely business district. On the other side, mountains of wood pulp line the riverbanks in front of the billowing Sappi plant. And straight ahead, like a beacon on the hill, is Gordy’s Hi-Hat. The sign towering over the squat white burger shack is a lowercase ‘g’ wearing a chef’s hat with a smiley face sketched in the g’s upper loop. It’s only open during the summer and has changed little in 55 years. It’s my favorite restaurant in the state of Minnesota. 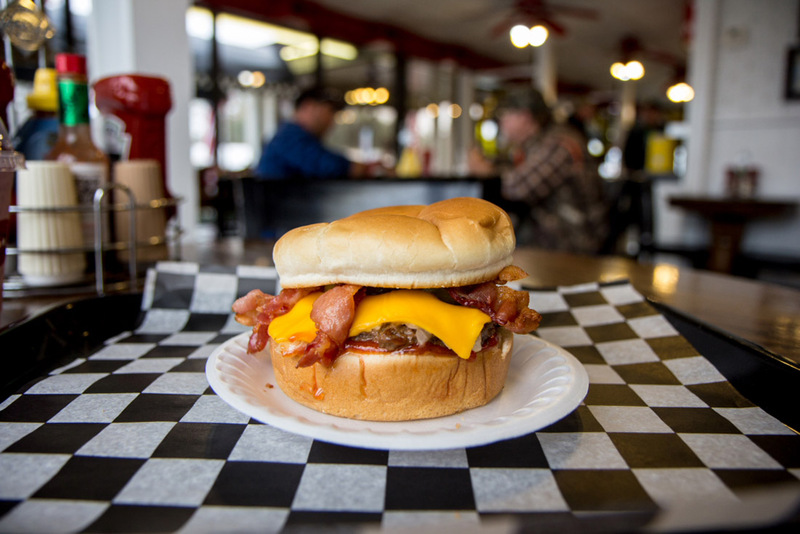 Inside Gordy’s, the aroma of fryer grease hangs in the air like a tantalizing humidity. I’m famished by the time I arrive and yet, each and every visit, I’m paralyzed by the size of the menu. They make roast beef and turkey sandwiches, fish burgers, shrimp burgers, fish and chips, even salads. There are windows beneath the counter that look into a refrigerator case of salads in clear plastic boxes and dozens of little salad dressing cups. In 30 years, I don’t recall ever seeing someone eating a salad at Gordy’s. 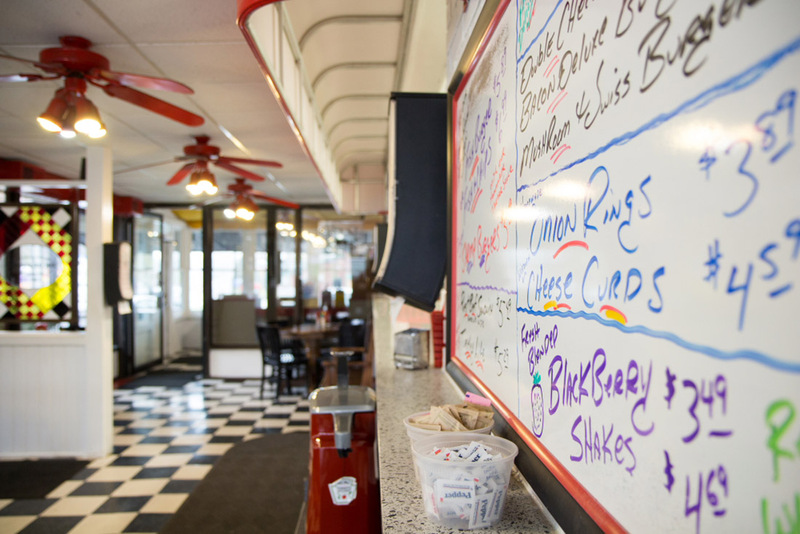 I don’t know why the menu variety stuns me like it does, because I’ve only ever ordered three things at Gordy’s: cheeseburgers, onion rings, and malts. To explain what they taste like is completely beside the point. Suffice it to say they are exactly what you’d expect from a roadside institution that hasn’t changed since the 60s: They are perfect. 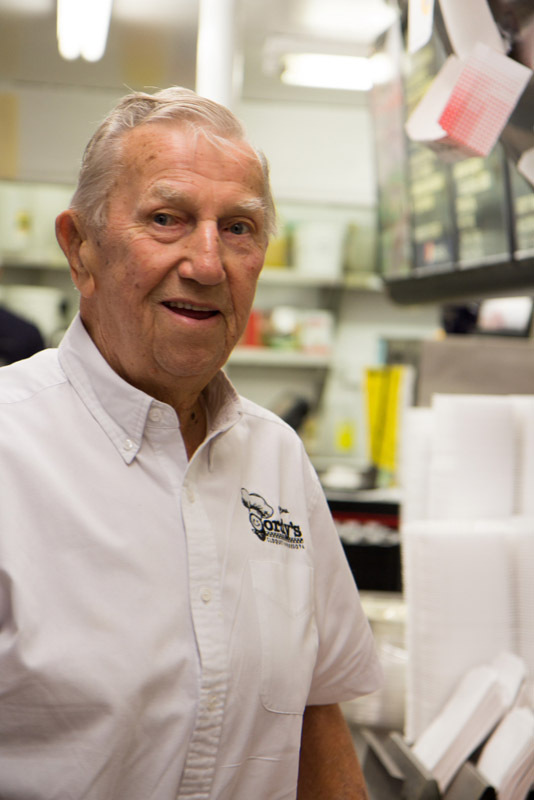 There is no demographically average customer at Gordy’s. The basic prerequisite for being there is owning a car, deciding to drive it from one place to another, and wanting to stop in between. I crunch through half a box of onion rings at my corner table, and notice a spectacular mix of Minnesotans passing through on this lazy late-spring afternoon. There always seems to be a uniform of some kind at Gordy’s. A few local cops take a load off near the windows that face the road. A railroad lineman with his neon green utilities vest and belt full of pliers grabs a pouch of burgers to go. A fatigued Air Force reservist chats at the counter. The dining room is studded by stained-glass dividers featuring diamonds in hues of ketchup red and mustard yellow. 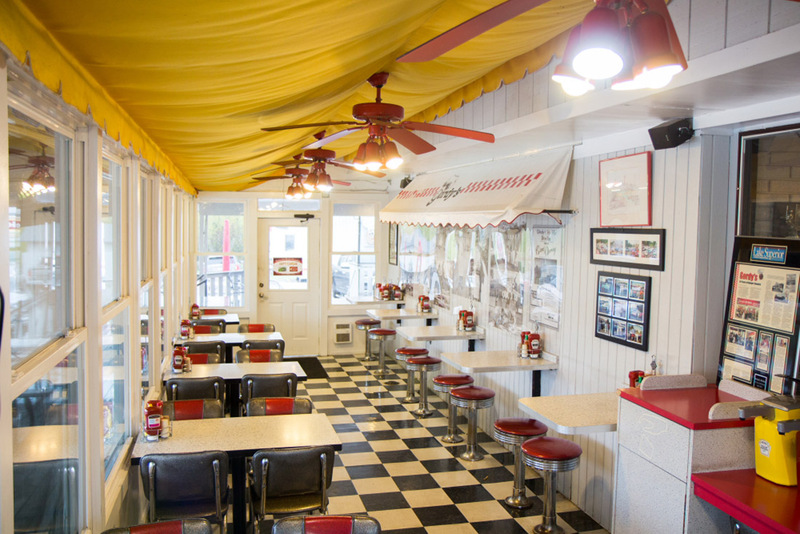 Food Network star Guy Fieri’s face is spray-painted into the ceiling beams of the kitchen with the caption “Guy Was Here.” Below it, a microphone dangles above the counter like it’s ready for a boxing ring announcer. A teenager sets down a tray overflowing with burgers and fries, grabs the microphone, and purrs Thirrrrrrrrty-eight-order-number-thirty-eight in a mild and soothing crescendo. My double cheeseburger is ready in shockingly short order. It’s the exact same burger I’ve had a few hundred times before: grilled onions sweating under a blanket of cheese, a soft bun, a well-done-yet-juicy patty. The Beach Boys’ “Fun! Fun! Fun!” plays on the speakers overhead. At Gordy’s, it feels like the song was released last week. An elderly woman greets the staff by name and gets a single hamburger to go. Lots of old timers come here throughout the afternoon. A pair of snowmobile-jacketed locals tear into a basket of fries. A couple of Gopher students stand awed in front of the menu. A big city–professor type in tweed and elbow patches strolls in for a malt. Oh, the malts: expertly creamy with huge chunks of strawberry or blackberry that clog up your straw every third sip. I dig into mine just as three burly, grizzled bikers do the same. The whipped-cream topping is getting stuck in their beards and they’re laughing about it like giddy schoolchildren. Gordy’s reduces us all to that age when we first scooped strawberry pieces from the bottoms of our plastic malt cups. I’ve been coming here for decades and have never been more than nine years old the whole time. My family needs only the thinnest excuse for a visit to Gordy’s. Once, at a silent auction, my father won four hours of flight time in a little twin-prop airplane. We took off from the Cities and buzzed along at 7,000 feet up to Duluth, looping high above the lift bridge then back over the iron ore pits and their grand concentric circles carved into the earth. After, we followed the St. Louis River back to the Carlton County regional airport, borrowed their courtesy van—a clanky blue Town & Country—and drove up to Gordy’s for what amounted to a couple hundred-dollar hamburgers. 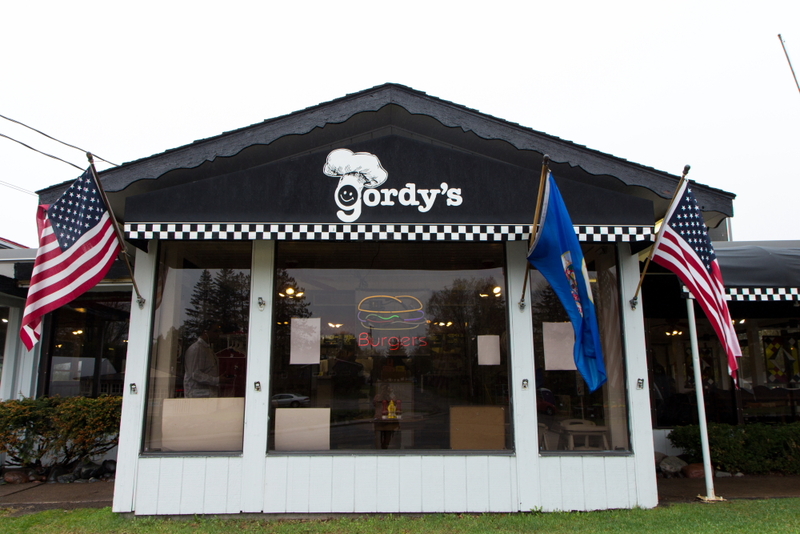 There are always families at Gordy’s. Mothers watch their small children squeal while playing on the playground across the parking lot. A family from the Cities walks in. Three teenaged girls scowl into their cell phones. They’re trying very hard to act unenthused. But Gordy’s draws out their stifled smiles one onion ring at a time. I wad up my napkins, push the last onion rings aside, and spoon the last of my malt from the sides of the cup. I step outside and, just like that, it’s 2015 again. I’m one hour from Eveleth, 45 minutes from Half Moon Lake, 30 minutes from that rest stop where my brother Jimmy vomited that one time. I take a left turn out of Gordy’s parking lot. Now I’m ready to drive north.